Hobbies I have many hobbies, but they are all related with home. I like creating coziness. I pay a lot of attention to details. I love attractive dishes in the kitchen, beautiful furniture with cute pillows. I do a lot with my own hands. I try to give my best shot and love creating warmth and comfort. I love indoor plants, aquariums, photos on the walls. I hope my future husband will share my hobby with me and will be glad to create a hearth together. About Myself My name is Anastasia. I live in a wonderful small town and I am here in order to find my future husband, my soul mate. I am cheerful girl. I like talking honestly, because I appreciate honest and open conversations. I love reading and my dreamis to have a fireplace at home, near which I can read in the evening or lie down with my husband hugging. 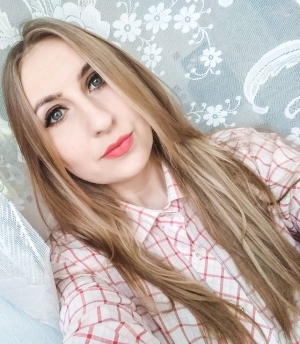 If you want to know more about me write me, I will answer you with pleasure! Search For I see my future husband as my protector and hero! My husband will be the best for me and we will be one team, like united body. I want to find a person who is cheerful and with a sense of humor, because this world is better when you can find funny moments and laugh at many situations. Therefore, I want to find reliable and serious man and at the same time cheerful and kind. If you combine these qualities - I have found you!